Celery and leeks inspired by the ancients. An ingredient of Italian soffritto, French mirepoix and the Cajun holy trinity, celery is rarely at center stage in a recipe. We'll change that in 2019. Celery has a long history that goes back to the Egyptians, Greeks and Romans. A National Geographic article describes what Howard Carter, the archaeologist who discovered King Tutankhamun's tomb (c. 1323 B.C.E.) saw in 1922: "When Carter removed the lid of the outermost coffin, he found a linen shroud covered in plant remains — strings of olive, willow and wild celery leaves, strips of papyrus entwined with lotus petals and cornflowers, and a wreath of cornflowers laid at the head." Much closer to us in time and space is a historical marker erected in Kalamazoo, Michigan, about Kalamazoo celery: "A Scotsman, named Taylor, grew the first celery in Kalamazoo in 1856. Diners at the Burdick Hotel regarded it with curiosity. Cornelius De Bruyn, a gardener, who came here from The Netherlands in 1866, developed the modern type of celery from the earlier soup celery. Other Dutch farmers by 1872 were turning the Kalamazoo mucklands into fields of celery. J.S. Dunkley sold medicines and condiments made of celery. Soon Kalamazoo celery was known the nation over. Michigan has been a leading celery producer ever since." Today California is the top U.S. producer of celery for the fresh market and for processing, followed by Michigan, though production moved to other cities in Michigan when Kalamazoo's white or "bleached" celery dipped in popularity. (For the interested, searching for images of Kalamazoo celery brings up a lot of historical records, including my favorite: the Kalamazoo Celery Co's letterhead, in which each letter is shaped from a plant or a rib of the plant). Besides celery (Apium graveolens var. dulce), there are two other cultivars of Apium graveolens used in the modern kitchen: celeriac (also called celery root) and leaf celery (Chinese celery, whose stems are thinner than those of Western celery, and curved into round, hollow stalks). The celery stalks, or ribs, emerge from the celery plant crown at soil level and are actually petioles or leaf stalks (the petiole is a stalk that attaches a leaf to the plant stem). A celery leaf encompasses the stiff leaf base at soil level, the stalk and the lamina at the top. The latter is what is generally referred to as the leaves of the celery plant. While I am not a fan of raw celery, I like cooked celery and always have. When she made ragù (the Italian meat and tomato sauce for pasta), my mother would use carrot and celery cut in large pieces, then take them out. I intercepted the vegetables and ate them. When she made bollito (boiled meat), the vegetables she added to the water (carrot, celery, onion) ended up on my plate. A recipe for boiled celery and leeks in the ancient cookbook De Re Coquinaria (On Cooking, aka, Apicius, compiled in the late 4th to early 5th century) inspired me to experiment. 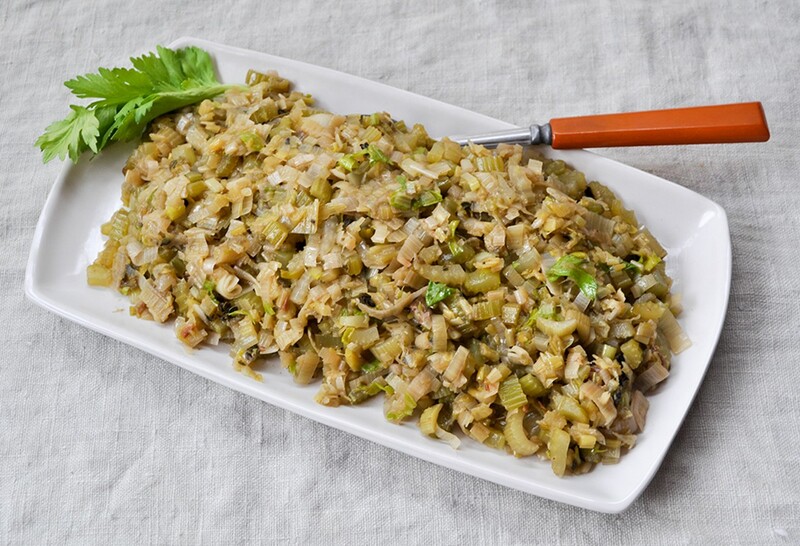 My recipe for braised celery and leeks is quite different from the ancient one, but I owe to it the suggestion to pair the two vegetables in a dish that has become a personal favorite. Ancient Roman recipes use garum as condiment, a fermented fish sauce, which I substitute with anchovy fillets. While anchovies provide a distinctive nuance, besides salt, they can be omitted to make a vegan version of the dish. If you are not sure whether you like anchovies, start by adding one fillet to the dish and add the other one if your palate would like a stronger flavor. Besides as a side dish, you can use the braised celery and leeks as stuffing for roasted squash, together with some cooked sausage meat (like mild Italian variety). Cut the leeks in half lengthwise and slice into 1/8-inch thick half moons. Rinse them in a colander, then place them in a bowl and fill it with cold water. With your hands, swirl the leeks to clean them well, then scoop them out of the water with a sieve or slotted spoon and drain them in the colander. Warm up the olive oil in a cast-iron skillet or pot over medium heat. Add the leeks, stir well and cook for 1-2 minutes. Cut the anchovy fillets into small pieces and add them to the vegetables. Stir well to blend. Remove from heat, sprinkle with the celery leaves, give a final stir and serve warm.